Medieval authors sometimes produced books which were compilations of excerpts from earlier theologians' writings. This manuscript has a copy of a work called 'Flowers of the Psalter' ('Flores Psalterii') by Letbert, Abbot of S. Ruf (1100-1110), in Dauphine. Letbert drew upon Augustine, Cassiodorus, and other early Christian writers. A manuscript like this one would have been used by theologians and churchmen to write sermons and further commentary. It also could have been used by monks in their daily reading and study. 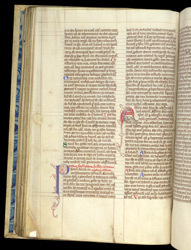 On this page, a commentary on a psalm begins, indicated by the enlarged coloured letters and the titles written in red. In the left margin, words are written without ink, simply with a stylus which indents the surface. Writing done this way is called 'drypoint'. Drypoint was often used for notes or, as in this case, corrections. The mark within the original line of writing indicates where the word supplied in drypoint should go.